I have been cycling like a wild banshee lately and absolutely loving it. Most days I commute to and from work and get another ride in either after work or at lunch, so I am really piling on miles. In addition, my training partners have been ratcheting the intensity on me big time. The final piece of the biking puzzle is that Caitlin is now riding constantly, and commuting daily, so I ride with her whenever I can. It's been a perfect storm of training and I have broken through a plateau. I have been feeling it lately. The climbing is just a bit easier, I am in a gear harder than usual, riding with a 15 pound backpack feels normal, and my pedal stroke is much smoother and faster than before. I decided to celebrate Kona by testing myself in a 40k TT in training. I picked a 3 loop course that was relatively smooth with some rollers to keep me honest. After a few cups of coffee, I loaded the car and headed out to the course. Warming up and checking my speed, it was not impressive. I felt pretty average. I did a few surges to prime the engine and rode about 8 miles easy. 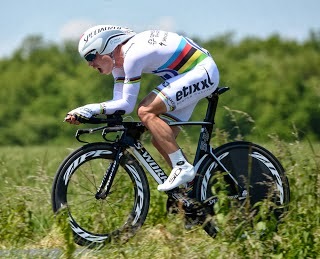 I turned my iPod onto the fastest tempo vulgar rap I could and shot off, imagining I was Tony Martin. I rocked back and forth for a few quick punches and then settled into a smooth rhythm of deep breathing. Suddenly, the legs weren't feeling bad at all. I turtled my head and squeezed my shoulders as narrow as possible to show as little of my giant frame to the wind as possible and kept pumping. I was sitting in the realm of comfortably uncomfortable and obsessively watching my speed hover around 27mph. I rounded the first corner and accelerated smoothly out of the turn. I focused on pedaling circles and tucked as low as I could get and into the next turn full gas. I hit a bit of a head wind in the final straight and knew it was the business end of the TT loop. It had the rollers and the headwind so the challenge was to not bleed too much speed and pick the speed back up after making the turn. 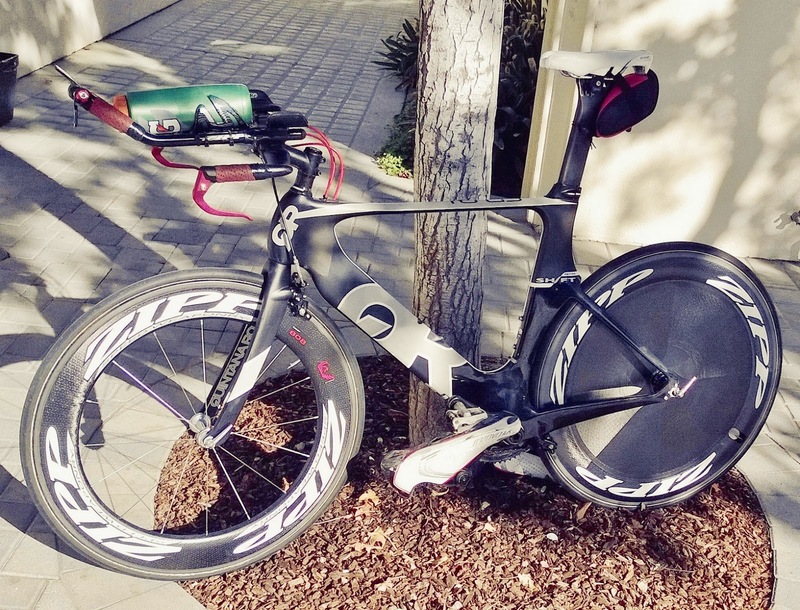 I moved back and forth in the saddle and pulled up on the aerobars to gain some leverage and kept the pressure high as my speed dropped. As I rounded the first lap, I noted 26.8mph average speed! It was shaping up to be a good day... but maybe I had gone out too hard. Didn't feel too bad but time will tell, I thought. I swung out of the headwind and back into my rhythm and around again. The next lap was a cruisey blur as I prepped for the hard push on the third lap. The headwind section got a bit more toxic as the wind picked up and I could tell a lactic storm was brewing. I hit the final lap and consciously pushed deeper to hold my speed. 27-29mph and still under control. I swung into the final turn and felt my power slowly evaporating as my speed started to trail off. I was close to the end so the pacing was solid but I needed to get out of the wind. I clenched my teeth and mashed the pedals trying to beat the clock. I looked down and realized it was possible to crack 56 if I pushed. I felt the flurry of acid in my legs and creeping into my arms as I started dipping into the well. The miles ticked agonizingly slowly. 24.5 miles.... 24.6 .... 24.7 .... 24.8. I strained, watching the clock slow down right in front of me. BOOM! DONE.... I let my legs go slack as I pedaled pathetically weak squares. I finally peeked at the clock. 55:53!!!! Average speed was 26.7 mph which, for me, is a massive breakthrough. I always hovered around 25mph for these types of efforts so to get up well over 26 in honest conditions in training, I was just over the moon. It got me thinking I might be able to dip under 55 minutes with a course with fewer turns and a bike that looks like this instead of the training version. I am racing HITS Olympic distance in Lake Havasu and then again in Palm Springs. I like what Andrew Starykowicz said before Kona... 'I have the thinnest playbook in this race. I'm planning on biking the house down and then hanging on in the run.' I'm going to give that a whirl after that ride!